On July 15, a judge provided the non-violent resistance of La Puya one of their biggest victories in the 3 years of their struggle. Judge Angelica Noemi Tellez Hernandez ordered the suspension of all construction at the Progreso VII El Tambor, mining site owned by the United States mining firm Kappes, Cassidy, & Associates. On July 15, a judge provided the non-violent resistance of La Puya one of their biggest victories in the 3 years of their struggle. Judge Angelica Noemi Tellez Hernandez ordered the suspension of all construction at the Progreso VII El Tambor, mining site owned by the United States mining firm Kappes, Cassidy, & Associates (KCA), near San Jose del Golfo. The judge arrived at the decision quickly after hearing from community members from the peaceful resistance of La Puya, and from mining representatives. The mining firm argued that they had obtained the proper permits for the construction, and that they had performed a community wide consultation on the project. But community members contested this claim. The judge agreed, and found that the mining firm had been operating illegally in their construction projects, and that there had never been a consultation of the mines neighbors, or of the surrounding communities. In the declaration, the judge called for “The suspension of all activities of the construction of infrastructure at the site of the Progreso VII Mining Project, while [the firm] consults the neighboring communities” about the project. The Municipal Council of San Pedro Ayampuc was given 15 days to ensure that the operations at the site are ceased. Yet the mining firm has refused to comply with the court’s order, and continued to bring machinery to the mining site. This continuation has sparked new tensions at the La Puya encampment. The decision confirms that the project was building infrastructure illegally; something that the communities have been saying since the project first began in 2012. Authorities from El Carrizal and El Guapinol filled the case in October 2014, claiming that the government and the municipality had failed to act on the behalf of residence. The mining firm is expected to appeal the decision. Despite the stopping the construction at the mine, the decision does little to impact KCA’s license to exploit the gold reserve near San Joes del Golfo. The mining permit for KCA in San Jose del Golfo is just one of 18 permits for mining interests in the region around the small community. But this is just the tip of the iceberg in Guatemala. 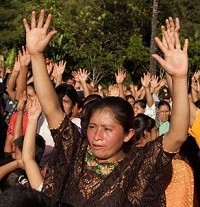 According to data from Ministry of Energy and Mining made available by the Council of Western Peoples (CPO), an indigenous political party that grew out of the movement against mining and other extractive industries in Guatemala, there are currently over 1,000 permits for mining across the country. Of these, 470 are for the exploration or exploitation of metallic resources. In San Jose del Golfo and nearby San Pedro Ayampuc, residents began leaning of the sale, and the interest of KCA to exploit the reserve. Quietly they began educating themselves on what the impacts of the mine would be for their community, and upon realizing the environmental impacts, they began organizing to defend their land and water. Then on March 2, 2012, as Yolanda Oquelí, a resident of San Jose del Golfo, was driving between San Jose del Golfo and San Pedro Ayampuc, she came across the arrival of construction equipment to the site of the mine. She quickly blocked the road, blockade of the entrance. Shortly after, others from the community arrived to support her. Since that day, the communities have maintained a 24-hour presence at the entrance to the mine, which they named “La Puya” after the thorns of the plants that grow in the hills above the encampment. The mining operation at the El Tambor site has been plagued with accusations of corruption since the project first began. The 2011 environmental impact study had found high levels of arsenic already present in the communities water sources. This was part of their reason for approving the exploration permits for the region, arguing that the levels already far exceeded acceptable levels. But a second independent environmental impact report challenged the “official” results, showing arsenic levels far lower than the government had argued. Other inconsistencies suggested that the official report was fraudulent. These inconsistencies were confirmed when United States based expert Dr. Rob Moran analyzed the report and determined that it was one of “the worst” quality study that he had seen in 42 years. These accusations have been further supported in the months since the revelation of wide spread corruption in the administration of Otto Pérez Molina in April 2015. The scandal has led to the resignation to head of the ministry of mining, Erik Archila, on May 15, and led to the arrest of the Vice Minister of Energy and Mining shortly after his inauguration, over accusations of influence peddling. These resignations have called into question the controversial mining and hydroelectric projects, which have driven social conflict in indigenous communities across the country. The community has paid a great price for their resistance. They have experienced both intimidation and brutal attacks at the hands of the police and the company. In June 2012, Yolanda Oquelí of the La Puya resistance was shot in the back while she stood at the barricade by an unknown shooter. Today she still carries the bullet with her. There has still yet to be an investigation by authorities into the shooting. Oquelí was lucky. Other social conflicts over mining have seen companies utilizing assassinations of community leaders to intimidate the movements against mining. On May 23, 2014, the Ministry of the Interior and the Guatemalan National Police deployed nearly 1000 highly trained elite officers to evict the community from their blockade. Police fired tear gas and rubber bullets at the members of the resistance, and successfully cleared them from the entrance of the mine as contractors arrived with machinery. The following year, the encampment was the site of an intimidation and violence at the hands of the police and mining employees. Early in the morning on May 26, the Guatemalan National Police deployed 400 anti-riot police against the 7-8 protesters who had the nightshift at the encampment, to ensure the safe passage of workers from the mine. This escalation followed days of increased tensions at the site of the resistance. The escalation in conflict had begun on May 23, when protesters blockaded the entrance to the mine in commemoration of the 1-year anniversary of the violent eviction that was carried out by the National Police against the resistance. 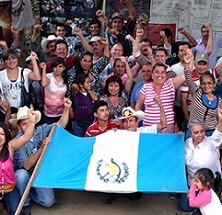 When the riot police began arriving on May 25, the community quickly moved to speak with the commanding officer and representatives from the Attorneys Office of Human Rights (PDH), and arrived at an agreement that would allow for the community to hold a high level dialogue with the Guatemalan government. But this agreement was quickly broken when the National Police deployed 400 anti-riot police to the site of the mine at 1am. The communities’ resistance to the mining projects has contributed to the increased criminalization of social movements in the country. The Guatemalan government and business interests have increasingly utilized the language of the internal armed conflict to label human rights defenders “guerillas,” “terrorists,” and has associated the defense of human rights with “armed struggle.” These labels have brought legal charges against community activists. “(The criminal charges) all come with the intention of damaging the social fabric and social organization,” wrote the Convergence for Human Rights, an alliance between Guatemala based human rights organizations. The threat of charges and prosecution creates fear in the communities that are exercising their rights. 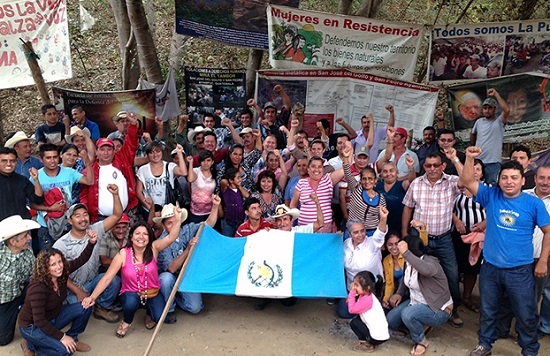 In September 2013, legal charges were filed against 12 of the leaders of the movement for alleged “illegal detention” of workers, “coercion,” and for “threats” against workers from the mine. The 12 defendants had been involved in the alleged kidnapping of workers from the mine. On February 27, four of those facing charges went before Judge Elvis Hernández of the 8th Criminal Court in Guatemala City, who proceeded to acquit the defendants from La Puya. The Government and mining firm have argued that the project will bring development to the rural community. But community members see things differently.